To start with the minutes of the last cabinet meeting are challenged by Cllr Powers – they are not complete in terms of including the question asked of Cllr Bramer as regards evidence indicating the economic importance cultural activities deliver in Herefordshire … and Cllr Bramer’s reply refusing to acknowledge this fact beyond the narrow area of the museum. Disappointingly the Monitoring Officer points out that minutes need only be accurate in terms of what they include, not what they ommit. She will consider the matter of minutes and tehir accuracy as part of the ongoing constitutional review. Orwellian. First up on the agenda is the SHYPP contract cuts. IOC proposed a £200k 2-year transition fund in the Budget council meeting. This proposal was defeated but the administration promised to provide the funding necessary to securely support transition. Of course this is not happening. Instead, a 1-year transitional fund of £78k is being provided to ease the reduction to zero of the county-wide preventative support that SHYPP provide to young people in supported housing and with high levels of need but still living in their own homes. Staged questions asked by Cllr Powell to give the appearance that what is being proposed is not going to be damaging to this young people’s housing project. Officers answer, suggesting that the council is going to use this transition period to ‘find out what the needs are of the young people who are supported by the project’. Pretty horrifying that the council doesn’t currently understand the need and the situation – before feeling confident to pull the plug on this project’s contract – given that this support service has been being built over the last 10 years. Cllr Matthews (Independent Group Leader) asks a bunch of questions written out for him – most of which unfortunately Cllr Bowen (Chairman of General Scrutiny) – seeks assurance that responsibility for homeless young people will revert to the council in future. He also questions reference in the decision report for referencing that CAB can be of assistance in plugging service gaps – when CAB are about to close in Herefordshire … the only county in the country to close this service. Unfortunately aren’t relevant to the decision on SHYPP funding under debate. Officers reply – implying that greater choice will be achieved by the revised service not relying on specific housing providers and housing in particular locations. Officer suggests that if not CAB then perhaps some other advice provider would be out there to satisfy any gaps created by these decisions. Cllr Powers (IOC) asks a series of skewering questions … why did cabinet approve a homelesness strategy only last week with no mention of the existence of SHYPP – was the decision to pull the plug on SHYPP already made? Why wasn’t the £4.6m additional funding from government been used in any degree to assist with transitioning? The funding has all been put in reserves. Why hasn’t SHYPP’s own counter-proposal report been referenced in teh decision report? Why is it not listed as one of the alternatives considered? Cllr Morgan states that the decision report needed another week’s work so it wasn’t considered at last week’s Cabinet … this doesn’t explain why the Homelessness Strategy makes no mention of the SHYPP service. She says that the council made a budget decision to move additional relief funds to reserves … what she doesn’t say is that this decision can be changed the next day – as the officers/cabinet members do regularly. Cllr Morgan says that change is inevitable and that the council may decide to change its mind in six months time if the decision looks like it was wrong. No mention that yeterday’s budget removed the otion for SHYPP to increase its funding from housing benefit recovery of rental. No understanding of the services currently delivered by SHYPP. Monitoring Officer clarifies that if SHYPP’s counterproposal was not relied upon by officers in making their recommendations there is no need for it to be referenced as a background report. Stunning! Cllr Andrews (Chairman of Health Scrutiny – responsible for the SHYPP service) has no questions to ask. Cllr Bartlett – raises concerns at the impact on young people countywide as a result of the reduced services to be provided by SHYPP. Cabinet unanimously approve the decision to reduce funding. Extension of the council’s agreement with the county’s Clinical Commissioning Group is approved without much discussion. Health Visiting & School Nursing Services now up for discussion … bottom line here seems to be to unringfence funds committed to these health services in schools to enable them to be put into the Children’s Services ‘pot’. A ‘strategic redesign’ is proposed with a direct contract for one year to be awarded to Wye Valley Trust while a review of the wider commissioning strategy is undertaken. Cllr Powell is disappointed that this single source contract is needing to be awarded when the need to combine and recommission services has been known about for ages … why are we needing to give ourselves another year to sort it all out when the cost of the extra contract is significant? Officer says that current services are not of an acceptable standard and nee renegotiating and redesign of the service needs to be considered in a broader context of early years provision … it was too difficult to do this all at once and in advance of today’s date. Cllr Matthews asks what the risk is that the single source contract will be challenged as it falls above the value where teh council is required to tender. The Monitoring Officer says the risk is assessed as low because the only organisations likely to challenge the decision are those who would wish to be considered by the council as future suppliers for the contract. Stunning! We don’t expect to be sued legitimately by disadvantaged companies because we would be likely to punish them by not considering them for future work. Designation of Director of Public Health … for the last 2 years we have bought 2 days a week of Shropshire’s DPH. Council is now proposing to commission for the ‘service’ of a DPH rather than to appoint a person. Officer argues that this is more robust because the ‘service’ will not sit with an individual who might ‘fall under a bus’. Also if the service is procured, it is not a person and doesn’t need to be considered by the council’s employment panel. 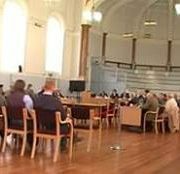 It is proposed that the council commissions a 4-year service to be provided to us by Shropshire CC at a cost of £65k p.a. up to £260k. Concerns raised about how this proposal will ensure that the role is fulfilled. We had better be good at writing the contract specification for this ‘service’. Cllr Powers asks what would happen if there were to be a public health emergency involving both Shropshire and Herefordshire? Officer suggests that review points are put in the contract but that in the event of an incident Herefordshire would be better served supported by a procured service frm a bigger authority.